Not enough power? Bah. Not exciting enough? Next. Doesn’t sound very good? I’ll give you that one, and only that one really, as a chink in the Volkswagen Golf GTI’s armour after 13,000 miles and nine months in our company. The Golf GTI arrived with us in its 40th anniversary year in late 2017 with little to prove: this was to be a celebratory long-term test of one of the greats of the industry. Well, that was the plan when we first started playing around with the VW online configurator 18 months ago. Then the hot hatch ranks swelled like never before in 2017. Hyundai found another part of VW’s territory to muscle into with the excellent i30 N, its first hot hatch. Honda sent more power through the front wheels of a hot hatch than any car maker before it with the Civic Type R, priced at not much more than the Golf GTI. Peugeot and Seat had fresh entrants to revitalise the segment too. So all of a sudden, the GTI was under the cosh, even after the subtle improvements of its own at the start of 2017 to bring a little bit more power and a light restyle. It needed to prove itself all over again. How would it do so? The Golf GTI has never been the fastest hot hatch, nor the most powerful. Limited-run specials aside, it has never set out to lap the Nürburgring as fast as an old single-seat race car. Its Top Trumps stats are pretty much always the worst on paper, as was ever thus with a GTI. Maybe life doesn’t begin at 40. And then you spend some time driving it. Any length of time, really – from a short nip to the shops, a commute, a cross-country dash, even a cross-continental one. I did all of those types of journeys and more in it, and the GTI just works in every situation in a way other hot hatches don’t. Many are sharper, faster and better on the limit – but better to live with? Not for me, and therein lies the longevity and appeal of the GTI. Ours was not the typical spec of a Golf GTI, because we sought to experience the car at its most pure, and most in keeping with its roots. For starters, it was a three-door – something of a dying breed in the hatchback world. As much as I liked the slightly more rakish looks, there were a few occasions when easier access to those rear seats would have been handy. To that end, it’s no surprise VW won’t make a three-door Golf with the Mk8 later this year. It was specced with a six-speed manual gearbox, something that was more of a no-brainer and a decision validated further by trying the DSG on offer in other hot Golfs. For in the GTI and its lesser power output, there’s joy in exploiting the top of the rev range and holding on to a gear as long as possible, and feeling your own way down a road. Ah, that engine. We specced the 2.0 TSI unit with the standard 227bhp, rather than with the extra 15bhp on offer with the Performance Package upgrade. That package also comes with beefier brakes and a diff, all things purity would turn its nose up at. So we did too. A fine engine, the 2.0 TSI. It’s one of those cars that has a ‘just right’ amount of power and torque to exploit the chassis and excel in the real world. And so it did. Whereas many of its rivals rely on heavily boosted turbocharged engines, the GTI’s is much more lightly boosted and encourages you to rev it up to the redline. To that end, it almost feels like an old naturally aspirated hot hatch: get the revs up, keep them up, and you’ll exploit the most from it. It’s a car that’s all about momentum, and real pleasure can be derived from keeping the engine speed up on a B-road. It’s above about 3500rpm where the chassis also switches from sensible-any-other-Golf into feeling more like a GTI, which is genuinely fun and a proper hot hatch to drive. I think some of the criticism of the Golf GTI not being fun enough lies in those first impressions. It doesn’t grab you by the whatnots with a dramatic bodykit, firm ride, noisy exhaust or huge shove off the line in this era of instant gratification and on-demand everything: it makes you go and find its true hot hatch capabilities at the right time on the right road. By the time you’ve found that road, you’d have already enjoyed plenty of its other qualities. Its comfortable ride and driving position, its quality (both perceived and in how good it is to use) cabin, its ability to just blend in and not have everyone try to race you away from the traffic lights. Miss it I shall, as no doubt will dealerships and potential customers. For VW has slimmed down the Golf range due to a combination of the imminent arrival of the Mk8 model and the trouble in squeezing its vast range through the new WLTP economy tests. Just an auto-equipped Performance five-door remains, and our model can’t be bought. That’s not to say the GTI is going out with a whimper in this seventh generation. VW’s still busy showing concept versions of the Mk7 GTI, such as the more potent and focused TCR with clear production intent, even if that production run will be a short one. Like a great rock band, the encore never gets old, and the show will continue to go on. For the Golf GTI, then, life’s barely even got started at 40. POWER DELIVERY No huge boost of torque low down the rev range, which is pleasing. A car that encourages you to rev it. RETRO DETAILS Those tartan seats and golf ball gearknob really add charm to the car rather than being a pastiche. USABILITY From taking Gran to Tesco or mates to the ’Ring, there are few scenarios in which the GTI can’t excel. NO VOLUME KNOB Pared-down digitisation cabin looks nice but robs you of the convenience of a simple volume dial. THREE DOORS Touch harsh, given I specced ’em. But I can see why the game is up for three-door hatches. Just back from one last road trip in the Golf GTI before Volkswagen takes the keys back. ’Twas to the Isle of Wight. The coastal road on the south-west of the island is a delight — not a driver’s road, but a ponderer’s one, from which to admire how beautiful a ribbon of Tarmac can be. There are few better views out from there in the UK, nor many better cars from which to enjoy it. I’ve often commented on the fine quality of the Golf GTI’s ride and now I’ve the physical proof: a safely delivered cricket tea, laid out across the boot and flattened rear seats. The jam tarts didn’t wibble, the egg mayo didn’t become an open sandwich, and the Victoria sponge on the front seat didn’t leave a soggy bottom for the seat’s next incumbent. A diesel hot hatch is something of an oxymoron. Yes, there’s plenty of torque and decent on-paper performance, but the game is up when you listen to the sound of the engine, run out of power halfway up the rev range and have such a heavy lump sitting over the front axle blunting the handling and the possibility of a sharp turn-in. Yet diesel hot hatches still exist, most famously with the Golf GTD. In the past few months of Golf GTI ownership, I often spot what I think to be a fellow GTI owner, yet closer inspection of the bootlid reveals it to be a GTD, complete with its 181bhp, 280lb ft, 2.0 TDI diesel engine. Anecdotally, in the south of England where I live at least, there seem to be more people taken in by the prospect of a diesel ‘hot hatch’ than a petrol one. Welcome to 2018, everybody. So what’s all the fuss about? A week in a GTD left me scratching my head, to be honest. Surely, it must be the fuel economy, the reason so many buyers have flocked to diesel for a generation? It can’t be that: I only managed just shy of 45mpg (official figure of 60.1mpg, but we all know what that number is worth) from a week’s worth of driving no more or less enthusiastically than in the GTI, a car I’m now seeing return more than 40mpg on a regular basis. I’d put that below-par economy down to the seven-speed DSG dual-clutch gearbox. It has a tendency to fidget around the gears and a reluctance to go into top gear, as well as a low-speed jerkiness in stop-start traffic that two passengers also noticed. Give me six gears that I can use with my left hand any day to add some extra range to a tank of fuel, and I’ll also have more fun in the process. Could it be the GTI experience that GTD buyers think they’re replicating? Hmm, can’t be that, as the two cars are so different that it’s not as simple as them being two sides of the same coin. The GTD is a hoot off the line if you’ve turned up the radio so you can’t hear the diesel clatter and it grips very well while cornering. There’s no problem with the ride, either – it’s firm, but in an involving way, much like the GTI – yet it’s the handling where it falls down as a hot hatch. There’s just no encouragement from the chassis for you to want to push it, nor much reward for doing so. The GTD, then, feels more GT than GTI: lose a letter off the bootlid and you’ll find where the car’s appeal lies. It’s a way to cover big miles quickly and effortlessly; a quicker, better dressed diesel Golf rather than a true alternative to the GTI. For that, it has its place in the Golf range, and that’s why you see so many of them. And at least you can buy one. For sad, shock news in the Autocar long-term test fleet car park: the manual, non-Performance-Package Golf GTI has been axed from VW’s range. WLTP, the new real-world fuel economy tests that all manufacturers must comply with by the end of the month and produce a figure for, has done for our version of the GTI, as the Mk7 Golf hasn’t got long enough left in production for it to be worth upgrading to the new requirements for every single model in the Golf range, particularly given how vast VW’s range of cars is and how many tests it has to do to meet the deadline. The GTI’s time is nearly up with us, too, and I’ll be hosting the wake on these pages in the coming weeks. The tissues are ready. FUEL ECONOMY I’ve praised the GTI’s frugality before and running next to a GTD shows again how impressive it is. THEY’VE AXED IT The only GTI you can buy now has the Performance Package. Shame, because I don’t think it needs it. The top-of-the-range infotainment system (Discover Navigation Pro, a £1325 option) comes with gesture control. In six months I’ve used it only twice — once to try it and once to confirm it is a pointless gimmick. For me, the future is instead in voice command, mixed with steering wheel controls. The GTI has both, neither of which I have complaints about. Forty-one point eight miles per gallon. Not my words, Lynn, but that of the fuel card we fill here in for our Autocar long-term test cars to keep track of the fuel used. That’s what a drive down to Cornwall saw me return at the green pump over a bank holiday break. Here’s an update to tell you the latest wonders of life with the most enduring and special of hot hatches to live with, and I’m starting with fuel economy. No, this is not a case of me having nothing more interesting to talk about, but a quite remarkable story in its own right. Think about that figure: 41.8mpg. In a hot hatch. That’s very good indeed. I don’t get any better in the 2014 Mini threepot in our household – a supposed economical urban runabout – nor in a more economy-minded petrol model with a smaller engine. Yet here’s the Golf GTI, with its big powerful engine, coming within a whisker of its 44.1mpg official figure. I’m regularly covering more than 400 miles between fill-ups too. It’s the latest advert for the fact that Volkswagen has given the Golf GTI the ‘just right’ amount of power. The 227bhp application of this 2.0-litre TSI petrol engine supplies a sufficient quantity of power to exploit the chassis in a fun way while not over-stressing the engine so you’re visiting Shell or BP every five minutes. Although so many turbocharged cars look good on the official figures, their boosting is such that you never get anywhere close to their claimed economy in real-world use. Sometimes cars have claimed miles per gallon in the 60s but you end up in the 40s. That’s not news, but it shows again the value in right-sizing an engine to a car if you really want to achieve decent fuel economy. A few more new discoveries emerged on the trip. The GTI sat-nav has a tendency to offer up a ‘sat-nav’ route: you know, one of those roads that looks main enough on the map but, when you’re down it, turns out to be only a single track with some moss in the middle and 10ft of grass banks/overgrown Cornish hedge spilling into the road from the side, and sprouting grass from beneath a pothole that’s been there since 1998. Meeting a car coming the other way can be intimidating on these roads. I remember negotiating one such road in a McLaren 650S Spider (now there’s a rubbish sat-nav…) and wanting to abandon ship and jump in the hedgerow – a result of the stress caused by trying to tuck into the side or turn around. But not so in the GTI, which feels light, nimble and manoeuvrable on roads like this, and visibility fore and aft is such that even reversing 100 metres isn’t in any way stressful. The trip also presented the chance to put the Golf’s full range of cubbyholes to the test. Most useful is the one that doubles as a rest for the driver’s left (and a passenger’s right) arm, which is perfectly shaped for housing a Cornish pasty. You’re not even limited by size of pasty, for the lid of this cubbyhole is adjustable, meaning that medium and large tiddy oggies come into play on the morning shop ahead of a lunchtime picnic. Of course, I went large: now that’s some real right-sizing. SEAT COMFORT Covered about 1800 miles in a month and not one numb bottom or achy knee to report. BLACK ALLOY WHEELS Someone here has nicked one. And there’s no hiding place for the scuff. Grrr. ‘Yeah, but a Golf R only costs a couple of grand more…’ is a line often trotted out in reference to the Golf GTI. Which is not actually true when you delve into the price lists: a three-door manual-gearbox equipped GTI costs from £28,465 (due to a small price increase since we took delivery of our car) and a three-door manual R is £32,880. A similar gap exists between the GTI and the next petrol Golf below it in the range. The price gap narrows towards the anecdotal £2000 when you switch to the monthly payment option presented by PCP deals, the way so many new cars are now bought. Just £10 a month was the gap we found on one website between the two hot Golfs on PCP, and there have historically been some very juicy deals on Golf Rs in particular. So the original point remains: the Golf R really isn’t much of a financial leap up from the GTI. You would then, wouldn’t you? For that extra, you get significantly more power (306bhp plays 227bhp) as well as two extra driven wheels. And power is, of course, everything in the world of hot hatches these days. Although… it isn’t really, is it? On paper, the GTI gives away quite a lot of performance for that £4415 (or tenner a month) price difference but any comparison between them is more nuanced than that. The GTI, remember, is the performance Golf, and indeed the hot hatch, that has endured longest of all, no matter how many different flavours of hot Golf have been above it in the range at various points. So, long-term test Golf GTI, meet Golf R. The R that has turned up for this exercise is a five-door, which also makes for an interesting initial comparison with our three-door GTI. Someone asked me the other day how I was getting on with the bigger, heavier doors of a three-door. To be honest, I hadn’t really noticed them, yet getting into the five-door R revealed a door that is much lighter in your hand and needs to be opened less wide for you to slip inside. The five-door hatch is definitely more suited to tighter spaces and has all the practical advantages. Looks aside, I can see why the days of the three-door hatchback are numbered. Yet that’s far too practical a point on which to lead a comparison of two performance Golfs. Of greater intrigue to me initially is that this R has a six-speed manual gearbox, as does the GTI in our possession. In the first few miles, it struck me that I’ve never driven an R with a manual ’box before, only one with the seven-speed DSG dual-clutch gearbox, which is a £1270 option. I’ve always thought of an R as a car that’s very naturally suited to an automatic transmission. It feels in keeping with its brief as the kind of all-weather, everyday hot hatch that prides itself on usability equally as much as being a performance tool. I still think that now. A DSG-equipped Golf R feels noticeably quicker off the line than the manual, which is reflected in the 4.6sec 0-62mph time of the auto, which is a full half a second quicker than the manual. You can simply concentrate on braking later and getting on the power earlier in the DSG variant and revel in its rapid cross-country pace. You also instantly notice the extra grunt in the R over its more famous sibling, its peak torque of 280lb ft eclipsing the GTI’s 258lb ft. Yet it’s not just that extra grunt, but how it’s delivered: bury the accelerator in the R and it stays planted at almost any speed. It just keeps going, most devastatingly off the line. The GTI is not as quick from a standstill but comes alive halfway up the rev range. It’s here where the GTI’s best work is done. It rewards you for getting it going and is actually quite unassuming to drive at low revs, whereas you feel like the R is constantly goading you to go faster. I was also surprised by the firmness of the Golf R’s ride and the noise of it from its 19in alloy wheels. The R is the most civilised of the 300bhp-plus mega-hatch club and I’ve never thought of it as a firm car. And it isn’t; it’s just firmer than the GTI. The noisiness of the ride is more intriguing given that I’ve grumbled to myself about the slightly underwhelming look of the 18in alloys of my GTI and believed there was enough compliancy in the ride to move up to 19s without doing anything untoward to the way it deals with bumps. On this evidence, I’ve suddenly grown fond of the 18s. In the handling stakes, GTI turns in to corners better and feels more agile. What the R lacks in finesse, it makes up for in grip and traction. The GTI darts around a corner, whereas the R barges its way around. If a GTI is quicker on the way in, then the R is undoubtedly quicker on the way out of the corner. So R or GTI? Sheesh. Before spending this extended period of time with the GTI, the R was my favourite all-round hot hatch. Yet the GTI plays that all-rounder card even more effectively. Yes, there are more exciting hot hatches than the GTI, including the R, but there simply aren’t any better ones, which is so crucial in deciding which car you’d rather live with over which car you’d rather have more fun with. There is one crucial thing the pair do have in common: they are both brilliant at being Golfs. RIDE AND HANDLING BLEND The GTI is sweeter than the R in this regard. Brilliant low-speed ride, fun higher-speed handling. STEERING WHEEL CONTROLS A solution to avoid using the touchscreen: ignore it completely and navigate menus with the wheel. SPORTY DESIGN We remain sold on the visual charms of a three-door hatch over a five-door. It just looks racier. EXHAUST NOTE Simply not special enough. The Golf GTI just doesn’t sound like a hot hatchback. FUEL ECONOMY Considered in isolation, the GTI’s economy is decent, but the 306bhp 4WD R averaged just 2mpg worse. My family is mad about VWs, so a trip to see my mum in Clevedon for her birthday was a great opportunity to stretch our GTI’s legs. It coped well with the bumpy road to my mum’s house and, unlike sportier models in the past, didn’t bottom-out. The GTI met an ancestor in my brother’s Golf Mk2, the similarities beginning and ending at the rear quarter shut lines and red GTI grille strip. It snowed the other week, as I’m sure you probably noticed. This was not great for many reasons. Chief among them at Tisshaw headquarters was an upcoming trip to Bruges and a Volkswagen Golf GTI in which to tackle the leftovers of the Beast from the East and get me to the Eurotunnel for 8.50am on a Saturday. The Golf GTI had shown itself to not be the most willing of companions in these conditions earlier in the week when ice caused a wheelspin-induced halt a metre short of the exit of the underground car park below my flats. Three more unsuccessful attempts were made, each employing a slightly different technique and each a more dismal failure than the last – a lack of grip from the tyres a limiting factor that could not be overcome until that evening, when the surface had been gritted. My partner’s 2014 Mini Cooper, parked above ground, was borrowed for the day, leaving the Golf GTI – or rather its tyres – sitting in the naughty corner for 24 hours. By Saturday morning, most people had abandoned the roads, the gritters had done their job and the temperature had nudged above freezing, all of which paved the way for a clear, fuss-free dawn run down to the Eurotunnel in the newly liberated Golf GTI. It proved to be a fine continentcrossing companion. My previous car, a BMW 320d xDrive, was so good at covering big miles that last summer I based my whole holiday on it doing just that. But given how fine an all-rounder itself the Golf GTI has proven in its first three months with me, not once have I pined for the 3 Series – until, that is, it came to booking this trip to Bruges. I needn’t have worried. The motorways covering south-east England, north-east France and west Belgium are not exactly bywords for ‘great driving roads’, but what shone through in the Golf GTI was its in-gear performance. The engine remains flexible and responsive even in top gear at 80mph, without a change down needed. The car may lack the horsepower of its hot hatch rivals, but I remain convinced the power output has been ‘right-sized’ to produce such a phenomenally well-rounded all-road machine. This is not a car that delivers big power at the expense of drivability, day-to-day usability or comfort. The Eurotunnel’s train carriages and their alloy-destroying inchhigh metal kerbs can be a humbling experience in wide, modern cars shod in alloys with low-profile tyres. I feared the GTI, and those 18in black alloys, would fall victim to them, much in the same way many an executive car and SUV ahead of me in the queue had, yet there was plenty of room each side. The Golf GTI is clearly a much wider car than the original, yet it has not bloated to the same width of some of its peers. That ease of placing it in tight spaces was welcome again by the time we reached Bruges and its cobbled medieval streets. The GTI was a doddle to manoeuvre. The steering – light, but not at the expense of feel – was a boon here, and the suppleness of the suspension over the cobbles was better than that of the 320d last year on similar roads elsewhere on the continent. Some stats: the 400-mile round trip returned worse economy than on a UK motorway run, due to the higher permitted speeds in France (and marginally so in Belgium), resulting in 35.2mpg at a steady cruise the other side of the water. Yet the entire trip was completed on the same tank of fuel, meaning no other stops were needed apart from our detour to the wine shop. The key fact, though, was that I was able to go on the trip in the first place. What was all the fuss about again? BOOT SPACE There was plenty of room for two big weekend bags and for a healthy top-up in one of Calais’ finest liquid merchants. WING MIRRORS The small, sculpted wing mirrors need too frequent manual adjustment at the end of a journey for parking next to a kerb. I often steer clear of playing with chassis settings, as I find they often have an exaggerated and cartoonlike effect on ride and handling. Not so with the Golf GTI, which, as with everything else, is subtle in the way it tweaks the ride, steering and throttle as you switch driving modes. It’s enough to feel different, but not too much to spoil anything. Volkswagen has never sought to make the GTI a mawkish recreation of the original, instead making it modern and relevant to the buyer of the day. Yet two retro nods have consistently been carried through: the golf ball gearknob and tartan- trim seats. I have warmed to both; they are so tastefully and subtly executed. They’re part of the car’s character but don’t define it. After driving our Mk7.5 back- to-back with a Golf GTI Mk1 for a recent photo shoot, I was genuinely astounded at how both cars managed to blend impeccable ride quality with effortless point-to- point pace. It’s a combination that the Mk1 introduced in 1976, and one that competing manufacturers are still struggling to match today. One of the biggest decisions to make when we were speccing our Volkswagen Golf GTI was whether or not to go for the Performance Pack. The common consensus suggests that it is something of a bargain, at £1360, in light of how it transforms the car. It gets you an extra 15bhp – taking the 2.0-litre turbo to 242bhp – as well as a proper diff and larger, more effective brakes. Much more than a ‘pack’, then, due to how much it is likely to change the driving experience; other car makers have used more modest upgrades as an excuse to host a new model launch. Yet, as we said at the very start of our time with the Golf, we opted against the Performance Pack, having been wedded to the idea of sampling the GTI in its purest form possible. Nor was I convinced thata car with this kind of power output really needs a diff or bigger brakes in the first place. The GTI’s power output of 227bhp in standard form might make it seem significantly less well endowed than most of its rivals, but what the car lacks in sheer grunt it more than makes up for in driving character. Broadly speaking, the engines of most of the modern turbocharged hot hatches are all so heavily boosted that they become dominated by low-end torque, and there’s precious little reward for really getting the revs up. The Golf GTI actually feels more old school in the way you tackle a B-road in it; it’s a car that comes alive the more the revs rise, and rewards you for keeping the rev indicator needle towards the top of the range.That’s not to say it does without low-end torque, mind. There’s still more than enough for daily driving: when you need to nip into a gap in traffic or change lanes in a hurry. Despite racking up a lot of miles in just two months of ownership, I have yet to really go on a really long drive just for the sake of it. I’m doing a serious amount of motorway miles atthemoment,whilewhettingmy appetite for the longer evenings to come with short B-road blasts. Yet Andrew Frankel has driven it for a sustained period on good roads. He borrowed it for our recent ‘greatest hot hatch of all time’ test (31 January). “I think it’s utterly brilliant,” came a text message out the blue from Frankel on the day he’d drove it, and while debating whether it could be considered the greatest hot hatch ever built. And why not? Objectively, the hot hatches of today are better in every measurable way than their forebears – it’s that subjectivity, that ‘feel’, where it can be argued many fall down once rose-tinted glasses are donned. Yet what this Golf GTI has over many of its rivals is feel and character, while also remaining so refined, usable and gentlemanly for everyday use, as our big mileage in the car testifies. It has a very strong case indeed to be considered the greatest, and you don’t need to have a tin hat on to voice that opinion. The current Golf GTI’s inclusion in Frankel’s big hot hatch test was interesting in itself, because as recently as our 12 July issue last year we named the Golf GTI Mk5 over a Mk7 as Wolfsburg’s finest hour in another Frankel-penned comparison. This time, we assessed every generation of Golf GTI (well, apart from the Mk3 and Mk4, because there are only so many wooden spoons they can take). The Mk7 in that GTI group test last July was equipped with the Performance Pack. If we’d had a standard version to hand, I suspect it might have even beaten the Mk5. The Golf GTI best demonstrates its versatility when the powertrain and suspension are set in opposing driving modes. I spent a 10-day stint in the car with the suspension in Comfort and drive in Sport, making it both comfortable and fast, traits very rarely combined in hot hatches. Even in its most supple suspension mode, the GTI still feels nimble. There are great cars to drive, and then there are great cars to live with. My sneaking suspicion in the early days of Golf GTI ownership is that it will be one of those rare cars that can fulfil both roles, with little to no qualification. So far, its legs have been stretched twice, on round trips from Berkshire to Norwich and then the Cotswolds, with a week or two of 50-mile round-trip commutes to Autocar HQ in Twickenham in between. I’ve been careful about running the car in. The engine has felt quite tight near the top end of the rev range in the early days so I’ve avoided over-revving it. It’s already showing signs of freeing up, though – a good thing because this is both an engine that is willing to rev (and, in doing so, you really get the best out of it) and one that’s also showing notable improvements in fuel economy as the miles rise. Both of those attributes are important in fulfilling the ‘great to drive and live with’ formula. One thing I’ve also tried to avoid is the kind of muck on the roads that might spoil the lovely pearly white paint. So imagine my delight upon discovering that to reach a ‘quirky’ place to stay in the Cotswolds, I had to drive up a two-mile dirt lane, littered with potholes and mud to interest both the local VW workshop and nearest hand car wash. Yet here’s the thing about the Golf GTI: it rides so well, and with such suppleness in the chassis, that it can even do a 10mph muddy lane crawl in relative comfort, and within 50m of being back on a ribbon of tarmac, turn in to a corner with real poise and involvement, and become a mature, quiet and refined companion by the time you next turn back onto a dual carriageway. Now there’s versatility. I admit to having reservations about just how involving the drive would be at the limit compared with its rivals. But although they might have the Golf GTI licked on the final 2%, the Golf GTI has them beaten on the first 98%. When you’re stuck trying to get on the M3 one Thursday morning for the fourth time that week, these things matter. And remember, even in the context of that 2%, it might be pipped to the post but it really does still handle. The Golf GTI remains the best all-rounder in this class, and there’s nothing in the early days of this long-term test to suggest otherwise. 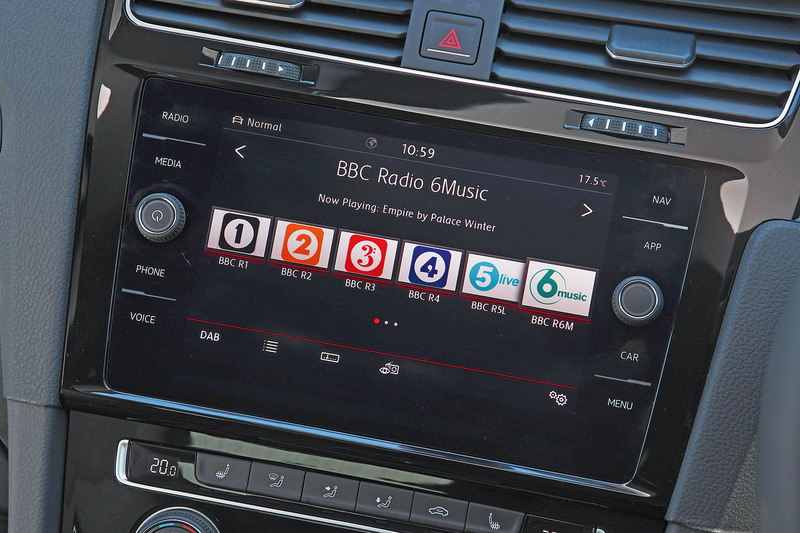 But a moan to consider, in the all-round armoury, VW: where is the volume knob for the radio? There is not a single button now, bar the touchscreen, everything sitting on a giant 9.2in screen in the middle of the dashboard. On two or three occasions, I’ve made a grab for it in a rush, as passengers have received important phone calls, or England have lost wickets in the Ashes, to try to bring some peace to the cabin. It has taken a good few seconds to do so, compared with the second or less the turn of a knob would take. It’s just not intuitive. It’s a shame, as the Golf GTI shows quite extraordinary pragmatism and ease of use in almost every area. Such was the case on a six-hour, 300-mile day of driving to Norwich as I otherwise wasted another Saturday afternoon watching some dross on a football pitch. High points of that first really long trip were just how supportive the seats were – kudos to whoever sculpted the foam inside the high sides to really tuck you into the seat. It gives the duality of sucking you into the drive when on a B-road and immersing you it on a long motorway run. The Golf GTI is an inanimate object, of course, but I have a feeling it would have felt pleased to be left in the driveway of Tisshaw Family HQ for the afternoon alongside the cars of my equally pragmatic parents, an original Audi TT and an original Subaru Impreza Turbo. The Golf GTI feels cut from the same cloth as that pair: a usable performance car that’ll stay relevant and appealing regardless of age. Just look at this: three doors, front-wheel drive and a manual gearbox. When did you last see a new hot hatch like it? Chances are it, too, was a Volkswagen Golf GTI, which has now been in the UK for 40 years, and this year there was a new one. Well, new-ish. The changes don’t turn the GTI into an all-new car, but they run deeper than a light nip and tuck. Better than a Mk7 but not yet a Mk8, the Mk7.5 name that’s been bandied about seems the best fit. That ‘point five’ gets you a little bit more everywhere. One of those little bit mores is extra power for its 2.0-litre turbocharged engine – 10bhp, up from 217bhp to 227bhp. That power output says a lot about the Golf GTI. It has made its name by being the everyday, usable hot hatch that’s far more about accessibility than being at the leading edge of Nürburgring lap times and a member of the 300bhp-plus, four-wheel-drive club. Of course, VW gave the pre-facelift Golf GTI a send-off by stripping it out and increasing the power in creating the Clubsport S.
That was a car VW used to tell the world: “Yeah, we can make a hot hatch like that if and when we choose to, but we think the world still needs a good, honest, wholesome hot hatch like we’ve been selling for 40 years, thank you very much.” So arrived the Mk7.5. We want to celebrate and discover the continued relevance of that message by sampling the Golf GTI in the purest 1977-spec form as the 2017 spec sheet will allow. For us, that means three doors instead of five, a six-speed manual gearbox (they don’t do a four-speeder like the original but will sell you a seven-speed DSG dual-clutch auto that goes without the golf-ball gearknob, so where’s the fun in that?) and the famous tartan fabric seats. That gearbox sends the drive to the front wheels only – four driven wheels remaining the preserve of the Golf R.
This is a Golf GTI as high-tech and customisable as it has ever been, thus very easy to push well beyond a Golf R in terms of price if you spend too long browsing the options list. Yet with my purity brief, speccing one beyond those aforementioned must-haves took no time at all, such was the ease of the configurator to create a car that just feels right. The big decision was around turning down the £1360 Performance Pack, which takes power to the heady heights of 242bhp as well as adding more torque, a diff, beefier brakes – and more weight. But in our original tests of the car earlier this year, as good value as the pack is, purity would raise an eyebrow to it, so we thought our money was best spent on a few options instead, such as the £830 Dynamic Chassis Control that adds adaptive dampers. Within a week of its arrival, the £295 Climate Windscreen that clears the winter’s first morning frost as quickly as it takes the standard heated front seats to create a more agreeable temperature for one’s backside seemed a sound investment, while the £265 rear-view camera appeared a good value way of keeping that new-look rear bumper and subtle twin split exhausts nice and shiny. The Oryx White Premium Signature paint was a bit of an extravagance at £990 (given a less pretentious name for it could be ‘shiny white’), the 18in alloys less so at £495. Inside the car, your eyes will be drawn to the new infotainment features offered on the Golf as part of some quite wide-ranging changes to the interior. All the 9.2in infotainment display’s buttons are removed when you go for the £1325 Discover Navigation Pro system, leaving it to be operated via the touchscreen, gesture, voice and steering wheel controls. In truth, it takes some getting used to, and a precise hand to operate the screen, no matter how lovely the graphics or how fast it is to respond. I’ve found myself so far mostly using the digital instrument binnacle for key information now navigation is only displayed on it. It’s closer to my eyeline and doesn’t need a hand off the wheel to operate. But I wouldn’t mind if there was a cassette player in the middle of the dash so long as the car turned in and had a turn of pace like a Golf GTI should. Thankfully, first impressions reveal that the Mk7.5 does. For the Golf GTI, it seems life’s not beginning at 40, more it’s continuing to age most gracefully. A fun months-long birthday party surely lies ahead. For our Readers’ Champion prize in this year’s Autocar Awards, we asked you to vote for the car that most changed motoring – and your winner was the Mk1 VW Golf GTI. Can a modern GTI live up to the high regard the original is held in, and remain an enjoyable hot hatch once that warm glow of nostalgia has subsided along with new car smell? Tough ask, although we’re very much looking forward to finding out. as well gone ahead and bought the Performance Pack and had a more enjoyable car..
Will they let you order one without DCC? I'm getting suspicious - you rarely see reviews of cars on standard dampers any more. Yet that's what many customers end up with because the option is always cripplingly expensive, and creates an expensive maintenance issue once out of warranty. Why cant companies make cars that ride AND handle any more on one setting? Roads are not smooth and stiff springs/damper settings rarely help on the road anyway. I kind of get the point of switchable damping on a car that's going to be tracked, but otherwise no. Give me one setting that works and quality dampers. The Bilsteins I fitted to my GT86 make it better handing AND better riding so it can be done. Still the aspire Car for many, it still looks fresh and fulfills all the important criteria too! How much better is this than a mk5 which was the golf that got its mojo back? I don't mean faster just better or more fun? I haven't driven a current GTI, but have driven the 5 and 6 both in DSG form. The Mk6 felt quicker than the 5 with more instant acceleration. However, the 5 was probably the more fun of the two. A 40 mile drive to the coast along twisting and crucially, empty, B-roads is in my top three drives of all time. So much fun - I had a smile on my face throughout and so did my passenger (who was also the owner)! Thanks, I was wondering mainly because the 5 was so highly rated and later versions only seem quicker, wasnt the 5 also over engineered and too expensive to manufacture? Must make it an excellent used buy and a guaranteed future classic. Have only just seen your reply - apologies! Generally speaking, the mk5 was over engineered and cost a lot to manufacture which is why the interiors weren't perceived to be as good as the 4's. However, most definitely an excellent used buy and future classic! Last time I looked well specified and looked after 5's with the DSG box in particular (and with sensible mileage) were pushing up to £8k which is a hell of a return on the original list price! I think they're a bit lower now but I would definitely say this is a future classic! Bit like the Civic Type R circa 2001-06....if you have a good one with low mileage, particularly the facelifted version, then you're looking at a very good return on the original list price vs the age of the car! after the adaptive suspension is not typical. also these extras reduce discount or are charged at 100% depreciation on lease. Does most things you would want, and few you would not want.